A white marble tablet mounted onto the wall on a dark wooden backboard. The tablet has a triangular head and the dedication is written in incised black capital lettering in the centre. 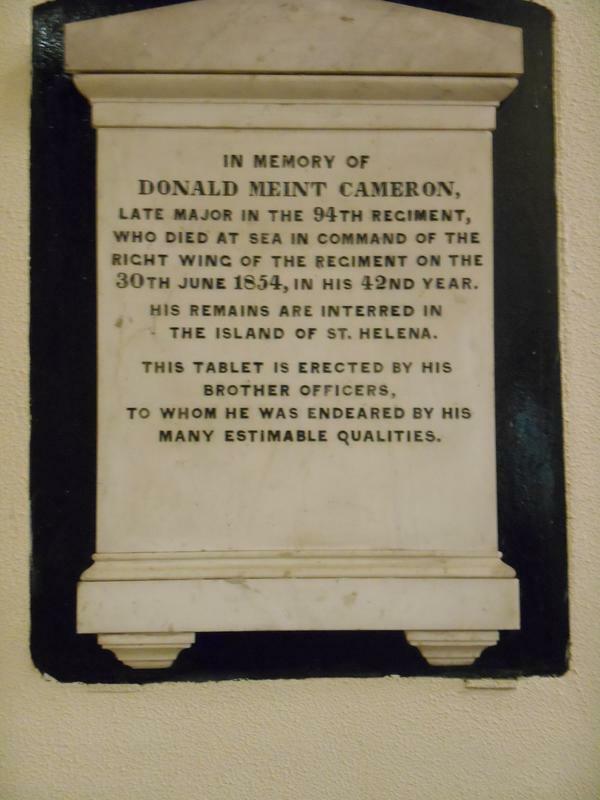 IN MEMORY OF / DONALD MEINT CAMERON / LATE MAJOR OF THE 94TH REGIMENT / WHO DIED AT SEA IN COMMAND OF THE / RIGHT WING OF THE REGIMENT ON THE / 30TH JUNE 1854, IN HIS 42ND YEAR. / HIS REMAINS ARE INTERRED IN / THE ISLAND OF ST. HELENA. 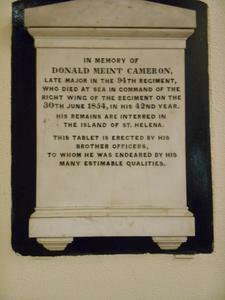 / THIS TABLET WAS ERECTED BY HIS / BROTHER OFFICERS, / TO WHOM HE WAS ENDEARED BY HIS / MANY ESTIMABLE QUALITIES.